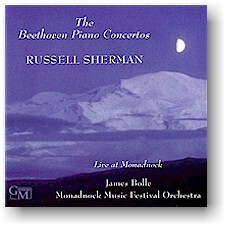 The first American pianist to record all 32 Beethoven Piano Sonatas and the five piano concertos, Russell Sherman follows the success of last year’s Complete Beethoven Piano Sonatas box set with this beautiful live recording of the Beethoven Piano Concertos on 3 CDs. "Sherman belongs among the elite of Beethovians. He is a visionary artist, shedding new light and offering new insights into music that has been heard countless times."